In the following guide you will find detailed information on how to adjust the white balance preferences of your IP camera device. To implement this example, you need to have OZEKI Camera SDK installed, and a reference to OzekiSDK.dll should be added to your Visual Studio project. How to adjust the white balance preferences of an IP camera device using C#? You can discover the features within the methods that belong to the trackbar GUI elements (TrackBar_CbGain() && TrackBar_CrGain()). In the body of these methods you can see the statements that can be used to set the possible properties of the white balance feature manually: in order to do this you need a newCameraImaging object that is going to be set to the camera with the new values by SetAttributes() method. Finally, you have to refresh the camera's image settings by the RefreshProperties() method. 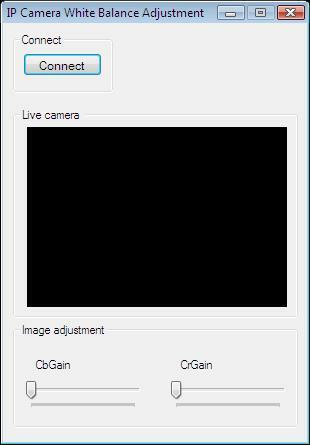 This statement is in the Camera_CameraStateChanged method: we set the value of the variable as soon as the streaming has begun. The invoked statements can be used to set the correct values of the GUI elements like the initial values of the trackbars and the values inside the labels each belonging to it's associated trackbar. Please note that not all of the IP camera devices support the adjustment of white balance features. You can discover the features within the methods that belong to the trackbar GUI elements (TrackBar_CbGain() && TrackBar_CrGain()). In the body of these methods you can see the statements that can be used to set the possible properties of the white balance feature manually: in order to do this you need a newCameraImaging object that is going to be set to the camera with the new values by SetAttributes() method. Finally, you have to refresh the camera's image settings by RefreshProperties() method. This statement is in the Camera_CameraStateChanged method: we set the value of the variable as soon as the stream has begun. The invoked statements can be used to set the correct values of the GUI elements like the initial values of the trackbars and the values inside the labels each belonging to it's associated trackbar. I cannot set the white balance. The scrollbars move but nothing happens. Why? Some cameras do not support the modification of the white balance. Why does the white balance change, when I did not order it?